It has been known for some time that the tallest tree in New Zealand is to be found in Orokonui Eco-sanctuary. 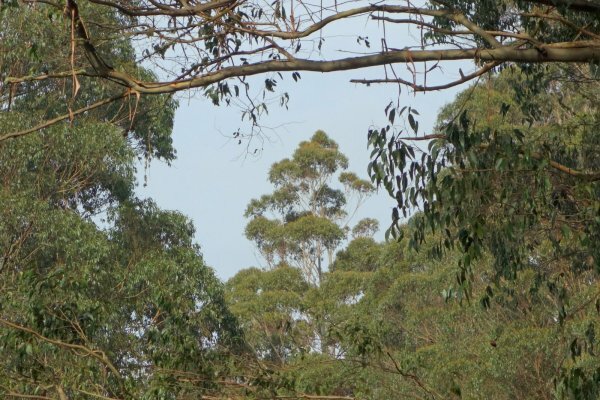 A stand of Eucalyptus regnans, planted in 1870 in the grounds of what became the Orokonui Home for Inebriates in 1902, started self seeding after fires in 1910, resulting a dense forest of competing trees in the lower reaches of the valley of the Orokonui Creek. The tallest tree measured in 1982 was included in Burstall’s Great Trees of New Zealand, as number 99, the Frank Pepers Tree, named after the New Zealand Forest Service officer who had identified and measured the tree at 69.1 m at that time. That tree was tape-dropped in late 2006 at 77.4 m (See OR/0796). In 2011, a climbing expedition including noted canopy scientists Steve Sillet and Bob Van Pelt found the Frank Pepers Tree to be reduced to 74 m, a victim of a damaged top. However a nearby tree was tape-dropped at 80.2 m tall. 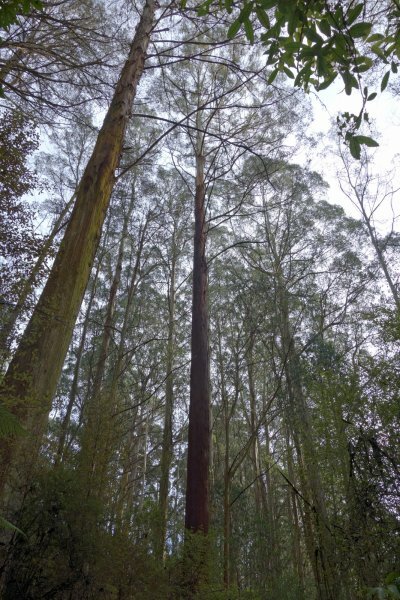 A re-measurement by the same group in 2013 determined the height of the new tallest tree to be 81.26 m – at the time the second tallest known planted tree after a 81.5 m blue gum near Magoebaskloof, South Africa. Due to the tree’s height and location, the true top is only visible from the track about 100 m away, with the base well obscured. This makes laser measurement quite challenging. The tree was subsequently climbed and tape dropped in November 2018 with the height being measured at 82.25 metres. Single trunk, first branch at around 19 m.
16 Nov 2018 Smillie, M.J.
At the lower end of the Robin Valley Track within the eco-sanctuary, around 45 mins walk from the visitor centre through remnant and regenerating native forest. The tree is well signposted only a few metres from the track. A fee is required for entry into the trust-administered eco-sanctuary.